Do you know, I've been agonising over these BG Two Scoops papers for about the last 6 months? No matter what I did with them, I never quite seemed to be able to get them to sit quite right together. This always really annoyed me as I could see that everyone else was completely able to chuck any combo together and get a blinkin' masterpiece! Well, I decided it was high time that I stopped faffing about and just shoved them together and do you know what? I don't actually think it looks too bad! 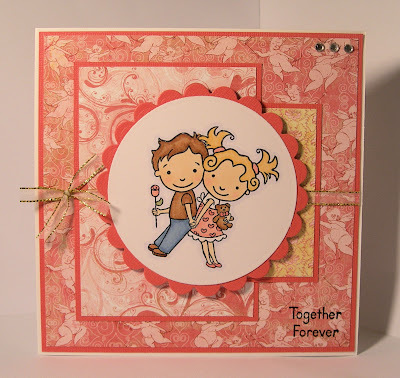 I made this one to this weeks Friday Sketchers sketch and thought that the cute BG cupid paper would go great with both the season and also my new fave stamp set! I also managed to find some card in my Core'dinations pack that actually went with the papers - a fact that I think makes me dislike the whole thing a lot less than I had on previous attempts! Paper: Basic Grey - Two Scoops. Ink & Colour: Memento (Tuxedo Black), Copics & ProMarkers. Embellishments: Hobbycraft adhesive gems & Papermania ribbon. so cute! the patterns of the paper look so sharp! great card! Ahhh...totally gorgeous card, lovely image and papers. Very cute!! Love that image. P.s...what do you use to get their cheeks so rosy?!?! This is great! The papers look wonderful together :) A masterpiece!! Cute image ! Thanks so much for visiting my blog and leaving such lovely comments. This card is just beautiful! You're sooo funny...well, you shove them together just beautifully...lol. Such a SWEET card Stacey! Love this & the one below, your colouring is fab. I have just brought these stamps, fingers crossed postie brings them today. Love the papers Stacey,they would have to go in my scrapbook so I didnt have to cut them up. A really gorgeous card Stacey! the papers go together really well and the image has been coloured brilliantly. Wow, this is just such fun Stacey, love the colours and image.. fab!! Great Card! Putting papers together is something i really struggle with too, but it always seems to look really good when other people do it! You rocked the BG papers!